It’s nearly that time of year…one of The Atkinson’s favourite events returns with a stronger than ever line up. The Big Blues Festival is now in its fourth year and once again it promises to be a weekend of great music, great food, great ale and great fun as we celebrate what rock, rhythm and blues has to offer! The line-up is as big as it is bold and presents music that is desperate to be heard, with headliners DrFeelgood and Ian Siegal, it’s a weekend you really don’t want to miss! Formed on Canvey Island in Essex in the early 1970s, Dr Feelgood remains one of the most popular and exciting live rhythm and blues acts in the world. The raw and uncompromising style of their performance resulted in the album Stupidity that immediately went to the number one position in the U.K. charts. Dr Feelgood have also enjoyed global success with a string of hit singles including Milk and Alcohol, Roxette, Back in the Night, Down at the Doctors, She Does it Right, Going Back Home and See You Later Alligator – which gave the group their first gold record. They are supported by George Shovlin and George Lamb the winners of 2017 Little Blues Acoustic Stage. 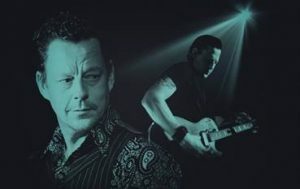 Ian Siegal needs no introduction; he’s a force within the UK blues scene winning countless awards. In more than a quarter century of touring Ian Siegal’s mission statement has barely changed: songs that are real, shows that resonate, vocals served raw. Today he is considered by many to be the most compelling British blues artiste since the great names of the sixties. In 2018 he will be touring a new album, his first studio recording of new songs in six years. Produced by American Jimbo Mathus, it is classic Siegal: full of the dark and light, clever word play and rough-hewn voicebox he is known for. It also marks the first studio recording with the band he hooked up with in 2013. Frequent touring has evolved a distinctive sound featuring Dusty Ciggaar’s tex-mex infused guitar licks. We are delighted to have him headlining the Saturday night of our 2018 Big Blues Festival. Brothers Keith and Stu Xander were discovered on YouTube by Gibson Brands CEO, Henry Juszkiewicz, and during their subsequent performances for the company at numerous international events from LA to Dubai, the band caught the attention of not just an ever-growing collective of fans but also industry legends such as Eddie Kramer (Jimi Hendrix, Led Zeppelin, Kiss, Rolling Stones) and Rick Allen (Def Leppard). Defying all expectations, lead singer and guitarist Keith Xander was born without a right arm below the elbow and plays guitar using a prosthesis and hook with a pick attached at the end. Although many who have seen Keith play believe him to be an extraordinary guitarist despite of his falsely perceived ‘disability’, he is a virtuoso musician in his own right and his playing rivals the best in the industry. The band established themselves as a live-performance juggernaut. Sam Kelly’s Station House has been in the business more than 40 years . His “Station House” band has been featuring on the U.K. music scene for many years. A “groove” band with dancing very much in mind. Their musical catalogue includes Johnny Guitar Watson, Keb Mo, Jimi Hendrix, Bob Marley, Gary Moore, Stevie Wonder, Little Feat, to name but a few. The band’s unique sound is influenced by New Orleans second line, soul, jazz, calypso, reggae and British funk. With three ‘lead’ singers supported by percussionist and internationally acclaimed drummer, the result is an eclectic fusion of music with its roots firmly based in the blues. The UK blues sensation Rebecca Downes is fast establishing herself as one of the star attractions amongst the new vanguard of blues performers in the UK, with her unique and powerful voice, drawing influences ranging from Blues and Soul to Jazz and Rock. Tom C Walker will be on the road with his new 4-piece band. A finalist of the UK Blues Awards, in 2017 he released the Into Space EP with the single Sweet Angel, straight in the Top 20 in the IBBA Blues charts while selling thousands of copies world wide in the first few months of release. In July 2017 The Tom Walker Trio hit the road for Tom’s first headline UK tour, “The Into Space UK Tour,” quickly selling out the Birmingham show before playing before Mungo Gerry at the legendary Ealing Blues Festival. Big Blues Festival tickets are on sale now £48 festival ticket / £35 Saturday ticket / Headline gigs are available for Dr Feelgood and Ian Siegal £17 available online at https://www.theatkinson.co.uk/events/big-blues-festival-2018/ via the Box Office on 01704 533333 and over the counter during opening hours. Don’t forget the Blues Matters Little Acoustic Stage entertaining everyone in the foyer on Saturday lineup includes; Mojo Hand – 1.30-2.15pm, Michael Woods – 3.15 – 4pm, Rowland Jones – 5-5.45pm and Trevor ‘Babajack’ Stieger – 5.45-6.30pm.